One of the British Columbia educational requirements is that my students have daily physical education. I teach in a school with over 500 students and one gymnasium so time in the gym is limited to twice a week. So how do I ensure my students meet their daily physical education requirement? In the past my students have taken part in a program called Run Across Canada. 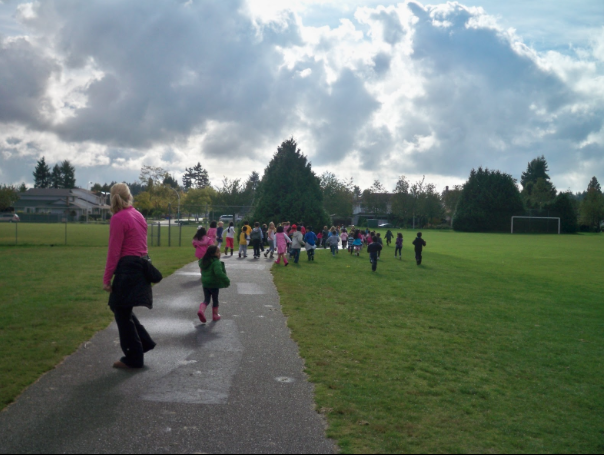 All the grade one students at my previous school ran and walked a 1.2 km route around our school and its fields twice a week. We totalled up our distance covered and mapped it on a map of Canada. It was a huge success as we travelled east from Victoria, British Columbia. We often made it into the province of Ontario. It allowed my students to have a better understanding of how large Canada really is. When we were running through Saskatchewan we "stopped" at Mrs. Cassidy's class to say hello. So not only did it get my students moving, it also helped us with geography. This year I'm extremely lucky to work with a teacher how teaches Yoga. Once a week she works with my students while I teach hers. My students are loving the calming effect it has on them, and as their teacher I'm loving it too. Another popular way for my class to move is the incredible symbaloos created by the Kinderchat crew - most specifically Matt Gomez and Michelle Hiebert. I have three of their symbaloos on our class blog which we use regularly and love. They are Kinderchat Dance Symbaloo , Just Dance Disney, and Just Dance 2. What I love about them is the variety of dances each Symbaloo offers my students. I'm all about choice of course so it's great for my students to have so much choice. Recently I have discovered the GoNoodle website and at the moment it's our most popular way to move our bodies during class. 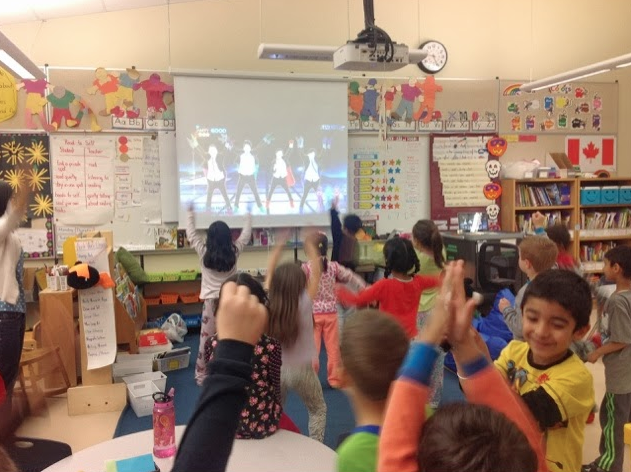 What my students and I love about GoNoodle is all the ways we can move our bodies. Sometimes we practice the track and field events lead by USA Olympic athletes. I love seeing my students exposed to different track and field events such as sprints, hurdles, long jump, javelin etc. The videos are short (most around 3 minutes) and are engaging for my students. We can do a few different events in a session, or mix them up through out the day. The site also offers dances, yoga, and breathing exercises. Lately we've been starting with a dance, moving to a track and field event, and ending with breathing or yoga exercises. As my students participate they earn activity minutes. As they earn their minutes their character changes in size. We are on our second character now. I'll be curious to see what happens when we clock enough exercise to expand all of the characters GoNoodle offers. These are just a few ways that we are meeting our daily physical activity requirements. How are you meeting yours?